One black ear, one white ear, a few black spots, a stub of a tail and big blue eyes are the distinguishing features of that laughing pudgy pup called Bonzo. In the early 1920's Bonzo reigned supreme. He was the envy of politicians, film stars, and beautiful women. His features beaming down from innumerable posters plastered across the world became an institution. He appeared in films and on the stage, and he was the sole subject for a series of art portfolios. He was also the inspiration behind the manufacture of a multitude of highly commercial merchandise such as toys - both cuddly and mechanical, ashtrays, pin-trays, trinket boxes, car mascots, jigsaw puzzles, books, calendars, sweets, and a profusion of postcards. Everyone, no matter what their age, adored the little dog with the crinkly face, golf-ball nose, and big feet. Bonzo and the situations his creator George Studdy put him in made him into a kind of 'Everyman', a comforting 'man-in-the-street' symbol which denounced all forms of pomposity. He drank, gambled, and had a wicked eye for pretty women, but Bonzo was never violent, never spitefully unkind, and never repulsively offensive. 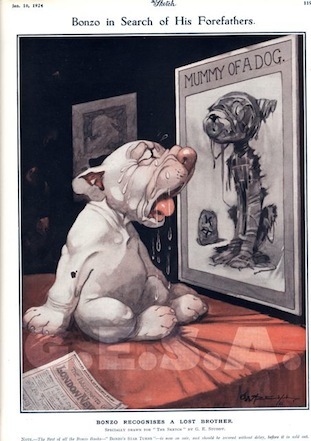 Looking back at the pre-1922 Studdy sketches of dogs it becomes clear that the original concept for a mischievous pup was born around 1911 - possibly earlier. 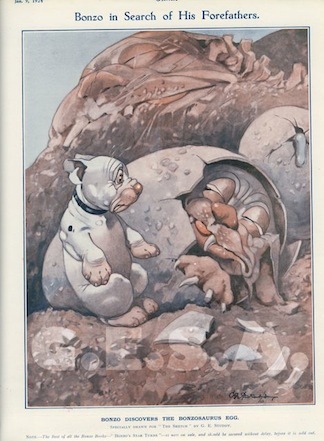 The first dog which, as Studdy put it, "could run by itself" appeared in Pearson's Magazine. The drawing depicted a running hound with a wasp sitting on its tail and was captioned "When you are on a good thing - STICK TO IT!". 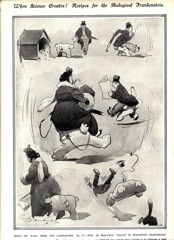 It was also produced as a framed print, together with a companion picture titled "If you see a good thing - GO FOR IT!". 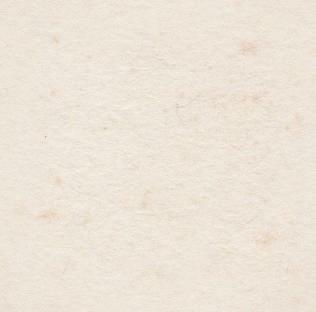 This unnamed dog continued to appear in various Studdy sketches, and gradually became a regular feature in The Sketch magazine. It was from this magazine that Bonzo finally sprang in 1922, and he never looked back. By the mid 1920's booksellers, stationers, toy shops, and the big department stores were selling a huge variety of Bonzo products. A.V.N. Jones & Co. of London produced two series of jigsaw puzzles, (thirty-one puzzles in all) each having a different colour picture of Bonzo, and consisting of "100 pieces on the interlocking system in Satin Walnut"! When assembled, the picture measured 10 x 7 inches, and the cost was three shillings and sixpence (about 17½ pence today!). The same firm made a range of ashtrays and pin-trays in a brown semi-porcelain, with a gilt edge and a black transfer print of Bonzo in the centre. Motorists could decorate their cars with Bonzo mascots, made from either chrome or brass. One maker produced a wonderful mascot of him galloping like the wind. 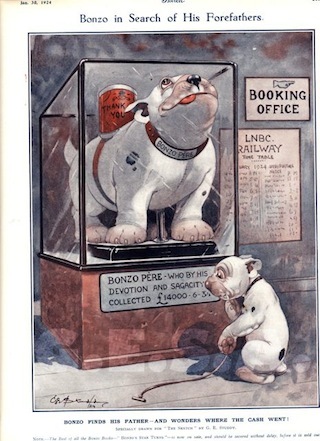 It was named 'The Telcote Pup' (after the manufacturer), was about 5 inches long, and sold for 3 Guineas in 1923. Confectionery manufacturers designed lollipops, jelly babies, chocolate bars, and sugar fondants in Bonzo shapes, and special Bonzo tins to sell them. A profusion of soft toys appeared in the toy shops for the very young, and pull-along tin toys for toddlers. 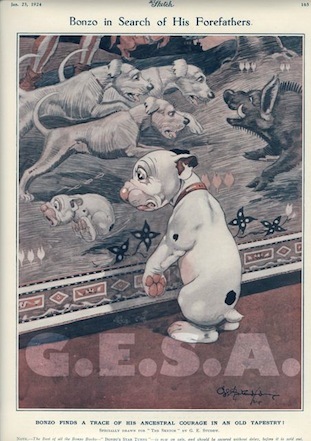 George Studdy himself was busy illustrating books and annuals written around Bonzo, and everywhere postcards featuring him in some situation or other could be found. Bonzo was a 'hit', not only in the United Kingdom, but all over the world. "Scientists take a few fossil bones of an extinct animal and design therefrom the complete common ancestor of various living types. At least they say so. Now Bonzo seems to me to have arrived in the same manner, only reversed. Either the terrier, sealyham, bull dog or bull terrier meets the eye during the course of a half mile walk. From the semblance of various traits or features of these four breeds, Bonzo has been evolved into the complete imaginary design of their common ancestor. The young of all existing types show stronger resemblance to their ancient progenitor than the adults, so the grown-up puppy-like Bonzo strictly observes this law of nature. Formula being: 4 pups / post bellum x 1,000,000 BC² / Bonzo Saurus = Bonzo!". "Some years ago a certain professor declared that in time to come we should all make use of mechanical contrivances, something like robots, to do our housework, to carry us to our offices on our shopping and sports trips - in fact to do everything and take us everywhere. This idea appealed to me and I made a cartoon of it for the editor of The Sketch. My robot took the form of a queer animal with the hind legs and tail of a dog but without a head to it. You will see from the illustration below what I mean. From that robot dog developed Bonzo. I knew at once that I had found in those hind legs and stubbly tail the germ of a really funny idea, and I went on experimenting with it until Bonzo as he is to-day finally emerged." The process of evolution that George Studdy outlined was, of course, tongue in cheek, but Bonzo had by that time become such a popular character that some people took it rather too seriously. Major J.E. Power, a well known dog breeder, asked for George's advice in order to produce a new variety to be called the Bonzo Terrier. His attempts involved the cross breeding of several strains in order to achieve his aim, but thankfully he failed dismally. Bonzo, you see, was unique! Although more than eighty five years have passed since this button-nosed, blue-eyed, elephant-eared, pudgey-footed little terrier that is Bonzo first captured the affections of the world, he is still very much loved and sort after today. Long may he continue to make the world laugh!